ALICE EVE COHEN Author, Playwright, Solo Theatre Artist - SOLO SHOWS for family audiences. SOLO SHOWS for family audiences. Alice Eve Cohen's solo shows for family audiences have delighted audiences at theatres, schools, museums and festivals, throughout the United States and on three continents. Performances, residencies, workshops, and master classes are available. Scroll down for description of each show. THE BALINESE FROG PRINCE: Alice plays all twelve characters in this beautiful and moving Indonesian myth, using a large green scarf to transform from one part to the next. With movement, song, drama and comedy, she brings this unforgettable story of a fearless frog to life. THE PARROT: Based on an Italian folk tale, Cohen plays a dozen wildly funny characters, with the help of puppets, masks, songs and musical instruments, including a dazzling solo for two recorders. A story within a story,the Parrot tells of a courageous girl who travels the world, saving princes and bringing joy to every kingdom she visits. The play moves fluidly between 2 fantastic stories: the story about the Parrot, and the incredible story the Parrot tells. THE THREE GOLDEN HAIRS is a based on a Grimm's fairy tale. Enacting the adventure-filled odyssey of a boy named Fortune's Favored, Cohen uses minimal props and a huge serving of comedy to create sixteen characters and multiple settings in this perilous and hilarious journey. Songs and blues harmonica complete the story, whose archetypal themes connect it to classic mythology. WALL TO WALL FROG: THE BALINESE FROG PRINCE and LAGUSHKA, THE RUSSIAN FROG PRINCESS. 26 characters, 2 actors, masks, puppets, comedy and music. 2 solo plays of magic, adventure and love. "The audience was delighted by the joyful performance of WALL TO WALL FROG, an insightful adaptation of two culturally diverse fairy tales." Welcome to a world where anything can become a character: a corkscrew, a glove, even an umbrella. Michael Orth’s one-man musical uses masks, puppets, and a large helping of visual surprise to bring to life an evil wizard, a magical frog, hundreds of Russian nobles and the largest woman in the world. 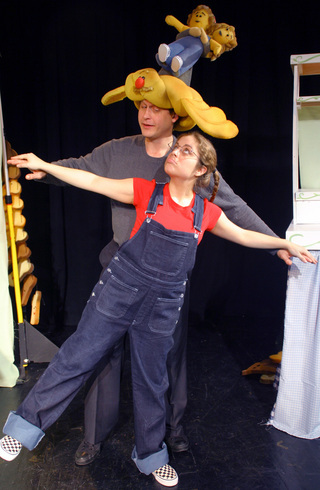 HANNAH AND THE HOLLOW CHALLAH: A play for two actors playing dozens of roles (and dozens of rolls!) 10 year old Hannah loves challah (the traditional Jewish braided bread). One day, she hollows a challah and finds herself inside the hollow (talking) challah, which flies her all the way to Breadland, where all the inhabitants are... bread. Tension (and dough) rises. Hi-carb comic mayhem ensues, in Alice Eve Cohen's funny and touching play for 2 actors and at least a baker's dozen puppets. "Hannah and the Hollow Challah is a delicious adventure through Bread Land. Our heroine, Hannah, uses courage, creativity and a bright, spunky spirit to overcome monumental challenges. A smart and adorable show with fabulous performances, I highly recommend it." “About a girl discovering her hidden gifts. 'Hannah' [has] relevance to the world of contemporary Jewish artists, who rework Jewish themes to create new artistic styles...Even Hannah’s mother...needs to bend and reshape Jewish tradition in order to be her authentic self." *Workshops and master classes: solo theatre, playwriting, memoir writing.